On sale now from Irish independent publisher Atomic Diner is the first issue of a three-part series Jennifer Wilde, written by Maura McHugh (from a story by Rob Curley & Maura McHugh) with art, lettering and covers from Stephen Downey. 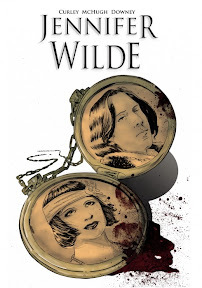 Set in Paris in 1921, the tale is an engaging mystety story, centring on a young French artist, Jennifer Chevalier, who becomes embroiled in death, espionage and revolution taking her across the three nations of France, England and Ireland – ably assisted by the ghost of Oscar Wilde. The story opens as Jennifer gets a visit from her estranged father, only for him to die in a street accident. His death raises many questions about her father, who has left behind items suggesting he was a very different man to that of his public persona as a war hero. In a Randall & Hopkirk-style twist, Jennifer's talent for seeing ghosts brings her into contact with the spirit of Oscar Wilde, who offers to help the young artist solve the mystery of her father's untimely death. 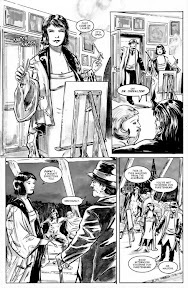 The book is an intriguing tale with some deft charecterisation and gorgeous art from Stephen Downey, and the 1920s setting offers rich, largely untapped setting. This is a great first issue and a title fully desrving wider reading. Check it out via the links below. Atomic Diner, which also runs the 'Free Irish Comic Day' events in Dublin, was set up in 2004 by Robert Curley, primarily to produce and publish a line of cross genre titles from horror to detective and of course good time super hero's. The company is 100 per cent independent and prides itself on good story telling from Ireland's top creators. Over the past seven years it has helped launch the careers of artists such as Stephen Mooney, Declan Shalvey, Will Sliney, Stephen Thompson and Bob Byrne and the publishers say they're proud to continue this tradition by working with people such as Terry Kenny, Maura McHugh, Stephen Daly and Gareth Gowran. To date they have released titles such as Freak Show, Atomic Rocket Group 66 and Gerry Hunt's In Dublin City, all to positive sales and reviews. Other projects include Roisin Dubh, Glimmer Man and The Wyndham Twins, with many more in the pipeline.